Time and again, we put religious claims under the white hot light of science, reason and the evidence, and almost invariably, those claims dissolve in the face of the facts. Yet they persist. They continue. They are everywhere. JT Eberhard is host of the popular blog, "What Would JT Do (http://www.patheos.com/blogs/wwjtd)." An atheist, advocate for LGBT rights, co-founder of Skepticon and sought-after public speaker. 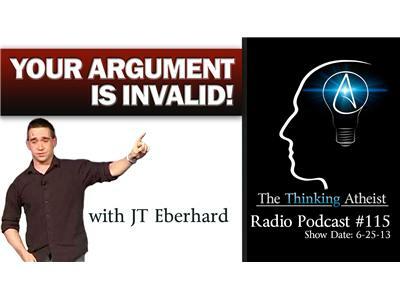 In this podcast, JT weighs in with his perspective on the worst (and most frustrating) arguments that skeptics encounter in the debate arena.